THE WATERFALL RAGLAN IS HERE! As exciting as release day is, this week is extra special because it marks the 1 year anniversary of Chalk and Notch and I have a great giveaway to celebrate! More details about the giveaway at the end of the post, but now – the Waterfall Raglan. GRAB YOUR COPY OF THE WATERFALL RAGLAN WHILE IT’S ON SALE THROUGH MONDAY, NOVEMBER 14TH. On Wednesday the 9th, it will also be available in the Chalk and Notch Shop and on ETSY. UpCraft Club is THE place to find awesome digital pdf sewing patterns and I always feel lucky to have my patterns among so many great designers. You can purchase patterns individually or you can purchase a membership and receive discounts on all patterns along with other great benefits. You can check out all the membership details HERE. The Waterfall Raglan is a relaxed fit Top and Dress with a gathered ruffle hem. The pattern is listed as: ADVANCED BEGINNER sewing level and I consider it a pretty quick sew. If you are new to knits, this is a good knit pattern to try since raglan sleeves are easy to set. To help achieve the perfect neckband, I have included 2 neckband options for each size and a knit stretch guide along with custom adjustments. There are detailed step-by-step illustrated instructions to help you along the way and if you’d like more help, the Chalk and Notch Patterns Facebook Group is a great place to get support. The Waterfall Raglan pattern offers both a Top and Dress view with 3 sleeve lengths and an optional pocket. This pattern works as a casual everyday top, a holiday dress or anything in-between. I’ve sewn up so many Waterfalls and they all have a different vibe based on the fabric used. 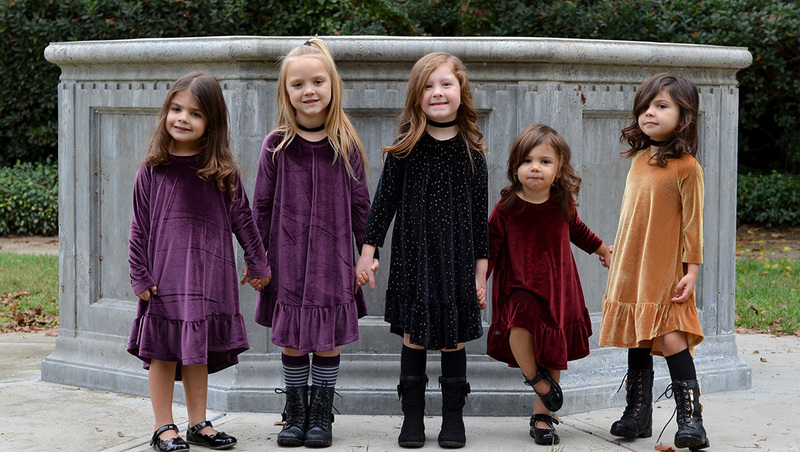 Currently I’m crushing hard on velvet and with the holidays approaching, I know what my girls will be wearing. The large size range: 12 months to 12 years, along with the versatility of this pattern ensures you are going to get a lot of mileage out of this pattern. A few recommended fabrics are: Cotton Jersey, Cotton Lycra or Spandex blends, Rayon French Terry, Rayon Jersey and as I mentioned above – my personal favorite – Stretch Velvet. If you’d like a little more inspiration, check out these gorgeous Waterfall Raglans created by some of my lovely testers. I’d love to see what you come up with, so if you share your makes, tag @chalkandnotch and use the hashtags #waterfallraglans #chalkandnotchpatterns so I can see your creations. If you need any sewing help or have questions please feel free to email me or join the Chalk and Notch Facebook group – I’m always happy to help. You can also follow Chalk and Notch on Instagram HERE. Now – for the anniversary giveaway I mentioned! One year ago, on November 9th, I released the Fishtail Kimono and launched Chalk and Notch. I can’t believe what a fun ride this has been. I’ve poured so much into this company and I’m really proud of the patterns I have released with the help of so many. In return, I have received so much more from this community: friendships, support and exciting opportunities – much more than I could have ever imagined. I am hopeful for where next year will take me and I’d love to know what you are looking for from Chalk and Notch patterns. Fun fact: I name all of my patterns after hairstyles – just for fun! 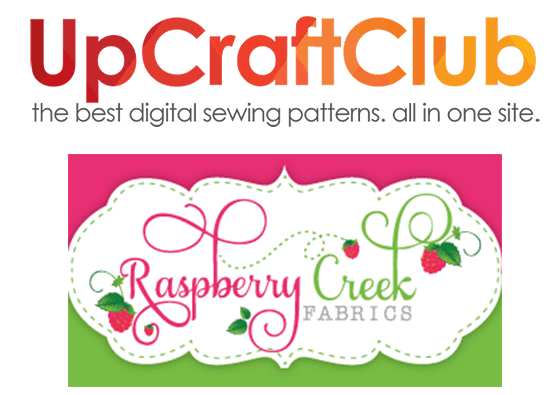 Thank you so much to UpCraft Club and Raspberry Creek for sponsoring this great prize. Thanks so for checking out my new pattern and good luck entering the rafflecopter! This little dress is amazing! I would love to make it for my girl! Congratulations on your anniversary! I’m sure many more great patterns will follow. Congratulations on your pattern! It looks amazing and yes, my favorite fabric for this it will be also stretch velvet. Right! Loving the 90’s velvet vibe! love this new pattern, so many possibilities! I love how sweet this pattern is! Love this pattern, you’ve totally nailed it again Gabriella! Wow! Congrats on another beautiful pattern and 1 yr anniversary! And, LOVE the new pattern! 12months!? That means my daughter and 12 month old niece NEED matching dresses for the holidays! Eep! Thanks for the giveaway! I didn’t expect to love the look of the velvet Waterfall as much as i do…probably going to have to make one of those for my daughter! Yes, she will love it! All of the girls love the feel of their dresses! Congrats on the anniversary! Looking at all the Waterfall raglans on Instagram, I would love to make a few for my girls. It’s such a cute pattern! Thank you!! I’m glad they caught your eye! I can’t wait to sew some sweet waterfalls or my girls! I’m obsessed with the stretch velvet too! Right, it’s just so good! Oh its so beautiful! I love the one with the white picket fence! How awesome is this pattern! Congrats on your 1 year anniversary! Love your patterns! I love this pattern and can’t wait to make a few for my daughter! Thank you so much! I hope it will be too! Oh my goodness! You are killing me with that stretch velvet! I MUST find some! Such lovely and amazing pattern! It is a MUST get pattern for me! 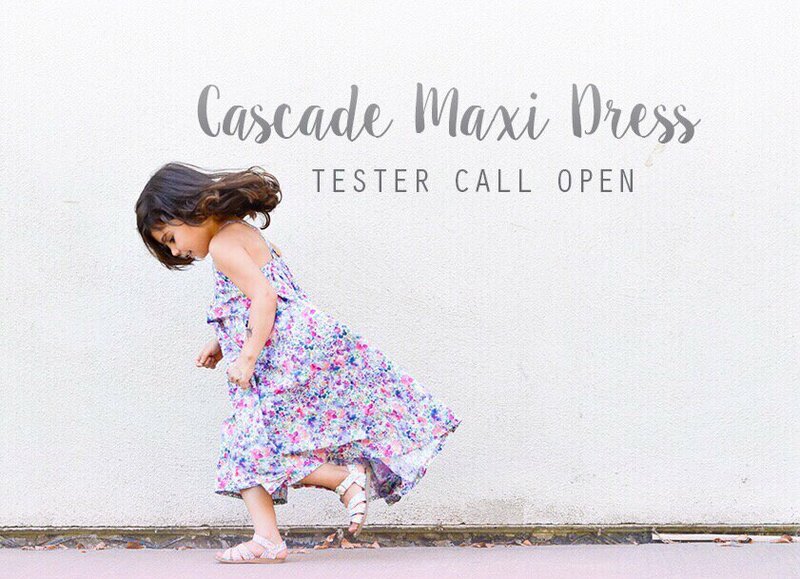 The waterfall raglan looks perfect for my girls, so cute! Darling! I keep seeing such great sneak peeks of this pattern and am excited to try it out! Congratulations on all your success! What a big year! Congratulations on your anniversary! Keep up the great work and beautiful patterns. Congratulations on your one year birthday. I’ve enjoyed watching your journey and was so glad to get to take part in your most recent release. I know there will be many more ahead! Congratulations on your 1 year anniversary! I love the designs and their names, I would not have picked that up though haha! What a great giveaway ???? I too am crushing on velvet of late! I have fallen in love with the waterfall !! I couldn’t even wait to see if I could win it I had to purchase !!!! I love this new pattern and I can’t wait to make it! I love all your velvet versions ????. I have been amazed by how much hard work and thought you pour into your pattern. It shows in all of your patterns. While I’m so in love with the waterfall raglan pattern and plan to make more, I’m so looking forward to your future patterns. Congrats on your anniversary and sooo many amazing patterns! Congratulations on your anniversary. 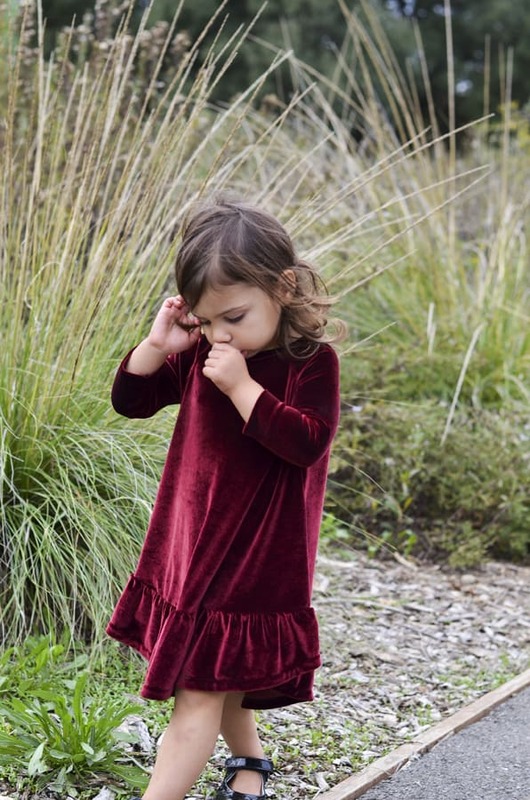 I think I now need to run to the store and buy velvet for my daughter’: Christmas dress. Well, after I run and buy the pattern. Love the Waterfall raglan. Happy First Anniversary! I look forward to seeing more of your beautiful designs. Such a beautiful pattern – great job! I love this new pattern ! Amazing pattern! Definitly one I want in my collection! new fan of your patterns here! Love the Waterfall! Congratulations! I love the new pattern! Loving the velvet… Definitely one for the festive season! I love this pattern! I have to have it to make dresses for my granddaughters and foster daughter! Waouhhhh love this pattern so much!!! Congrats! Love the new pattern!! Congratulations! Thank you so much for allowing me to be part of it! It’s a pleasure to see each new pattern! Congrats on the Anniversary!! Still haven’t made topknot yet.. waterfall and topknot next on the list !! Thanks for these beautiful patterns !! Congratulations on your anniversary and on your new pattern! Congrats on the anniversary! My girls would love that dress, I have some olive stretch velvet that might be destined for it! Happy 1yr anniversary!! I love the waterfall dress and shirt it is adorable! 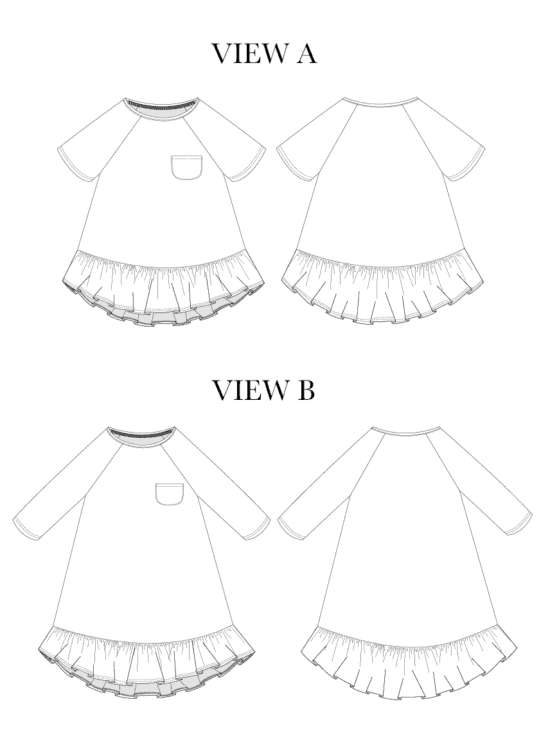 I can’t wait to make this dress for both of my girls! 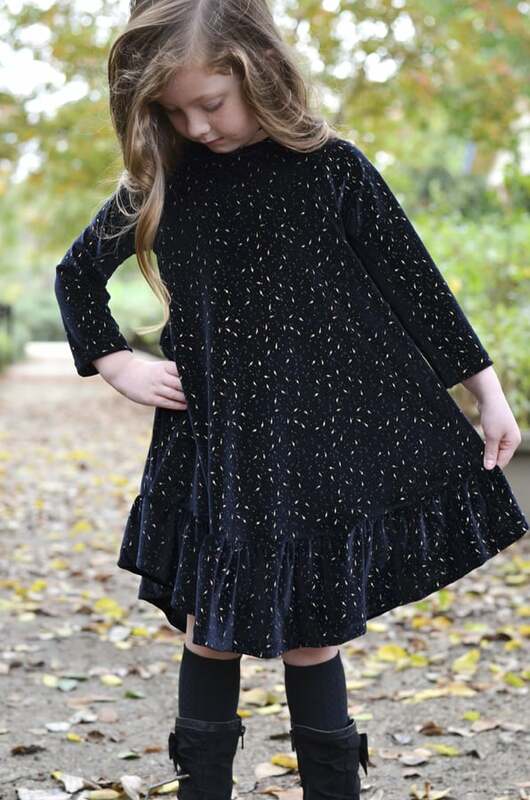 The Waterfall raglan dress in stretch velvet sounds like a quick and easy but gorgeous sew for the holidays. Thanks for the inspiration! I just LOVE the waterfall raglan!!! And the stretch velvet is my favorite fabric too! Happy anniversary and many more great years to come!